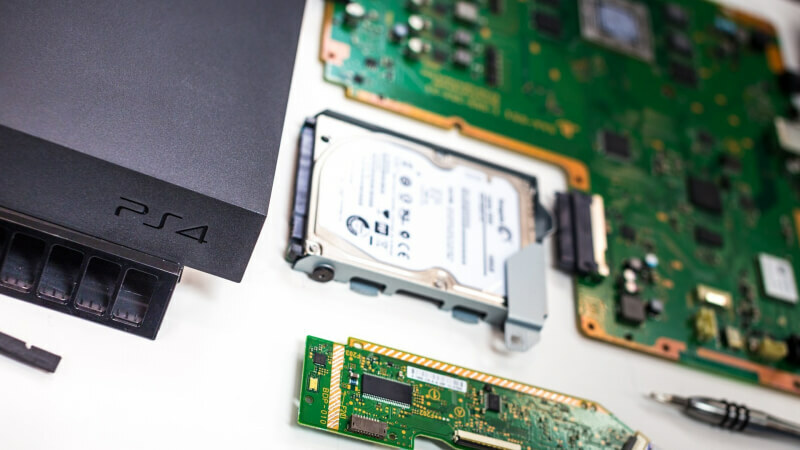 Sony's PlayStation 4 is powered by a GPU that is roughly equal to what PC graphics card? There is no exact equivalent because Sony worked with AMD to produce a unique APU for the PlayStation 4 that contained a custom 7970M, which was itself a mobile variant of early 2011's desktop flagship HD 7970. Compared to the desktop card, the 7970M ran 125MHz slower, had 12 less GCN cores, half the stream processors as well as less ROPS/texture units, while the PS4's custom GPU reduced those specs by another 50MHz, 2 GCN cores and other tweaks, not to mention that its RAM is shared between the GPU and CPU. The full size HD 7970 had 3.79 GFLOPs of compute power, the 7970M dropped that to 2.17GLFOPs, and the PS4's GPU cut that again to 1.76GFLOPs, which is roughly on par with a (then) $250 desktop Radeon HD 7850. Incidentally, the CPU inside the PS4's APU is comprised of two Jaguar-based quad-core processors.